Boondocks is the second restaurant from Chef Bea Vo and one of the most authentic American diners in London. Having just relaunched their brunch menu which is served on the weekends (9am-2pm), Boondocks is definitely one to check out. As recommended by Founder and Head Chef Bea Vo, the Roasted Strawberry Pancakes are ideal for the sweet toothed among us or the Bojangles for those who prefer a savoury option. You can view their brunch menu here. Halal status: All meat served is halal. Alcohol is served, no pork is served. Housed in a Grade II listed building, Christopher’s is a modern American restaurant set over three floors making it a great option for a fancy brunch. The weekend brunch menu features healthy superfoods as well as the usual brunch options. We’d recommend the Chocolate Brioche French Toast served with vanilla ice cream. Brunch is served on weekends from 11.30am-3.30pm – we’d advise you to book in advance. Halal status: 48 hours notice required for halal Wagyu beef, grain fed beef, chicken and lamb. Alcohol is served. One of London’s first halal Latin-Caribbean restaurants, Guanabana serves brunch every day until 4pm with a menu featuring classic Latin-Caribbean dishes made using organic ingredients. Halal status: All meat served is halal. Alcohol is not served but a BYO policy is in place. No pork is served. With a menu that is sugar-free, wheat-free, dairy-free and alcohol-free you might wonder what it is that Redemption actually serves. Well you’ll be pleased to know that London’s first alcohol free, vegan bar and restaurant offers great-tasting, beautifully-presented, Instagram-worthy dishes. The most popular item on the brunch menu is the buckwheat pancakes and having tasted it ourselves, we can understand why. Spoil yourself without spoiling yourself and indulge in guilt-free dining at their Notting Hill or Shoreditch restaurant. Halal status: Fully halal (vegan) menu. No meat or alcohol is served. Open from 11am Monday – Friday and from 12pm on the weekends, Drunch has a small brunch offering as part of their all day menu. With a heated and covered alfresco garden, the boutique restaurant is a great option for those occasional sunny days (the restaurant also has seating indoors). 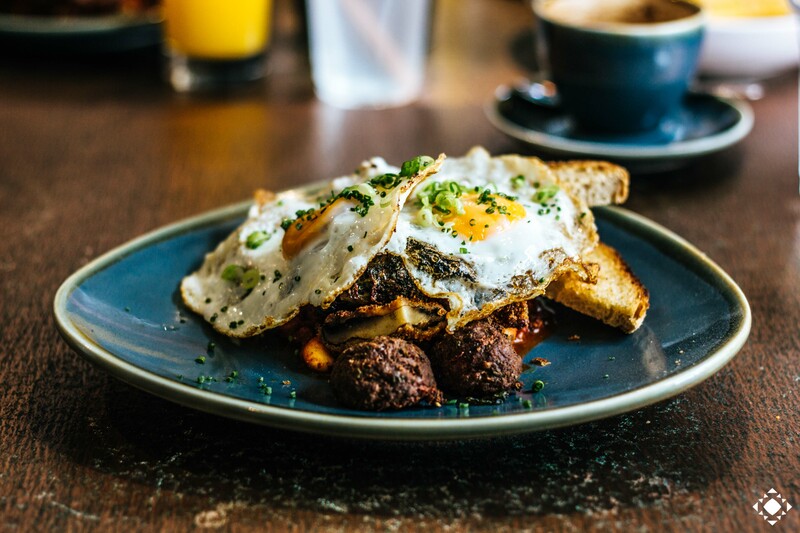 Click here to view our full guide to halal breakfast / brunch options in London.